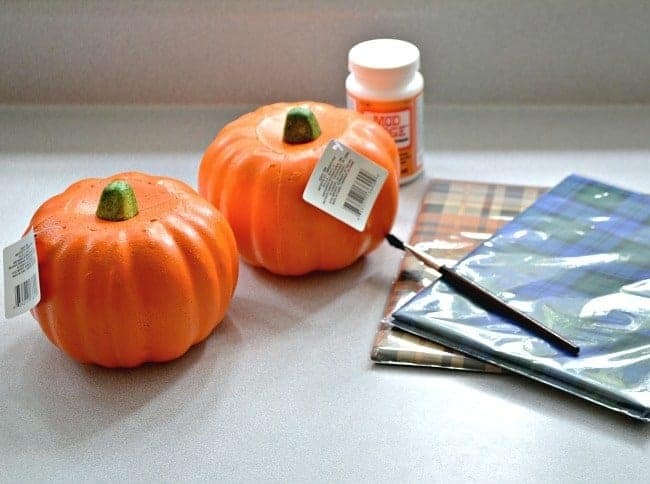 An easy Dollar Store pumpkin DIY project using plaid wrapping paper. Hey there, hope you had a great weekend! 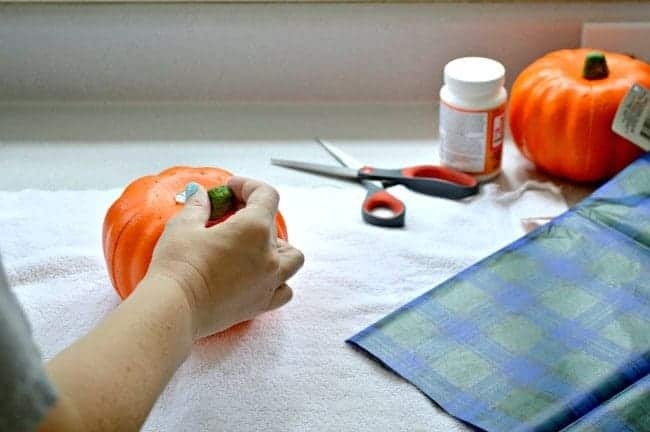 I shared two very long posts last week (here and here) and promised short and sweet this week, so I’m here to deliver with this quick and easy thrift/Dollar store pumpkin DIY. 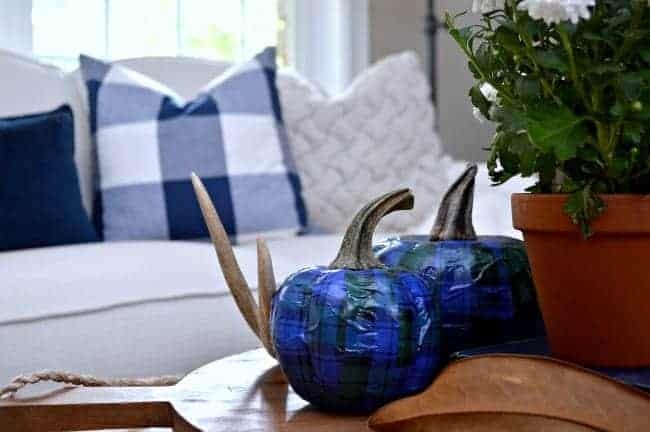 Anyway, I had this cute plaid tissue paper and really wanted to do something with it for fall, without spending a lot of time or money on it, so I picked up a few pumpkins at the Dollar Store and gathered my craft supplies. Then I just cut the tissue paper into strips. After a little trial and error, I found that if I cut the strips a little wider at the bottom and tapered at the top, they looked better on the pumpkin. Don’t get hung up on exact sizes though, this is supposed to be fun and easy. I cut a lot of strips at once so that I could just go to town applying them without stopping to cut more. I coated a small section of the pumpkin with Mod Podge, added a strip of tissue paper, and layered a coat of Mod Podge on the paper. It was that quick and easy. Remember, we’re doing easy with this project so I didn’t worry about lining up the pattern, I just stuck pieces on as I picked them up. Once the whole pumpkin was covered, I let it dry. After it was dry, I added the dried pumpkin stem. A bit of hot glue and it was looking like a pumpkin again. Each pumpkin took about 20 minutes to make, plus drying time. The cool thing about this is that you can do whatever color or style you want. Plus it’s super cheap, especially if you can pick up a couple of old, ugly pumpkins from the thrift store. I thought the blue would be my favorite but I’m partial to the orange plaid. I love how they turned out. I mean…they’re plaid. How can you go wrong…right? 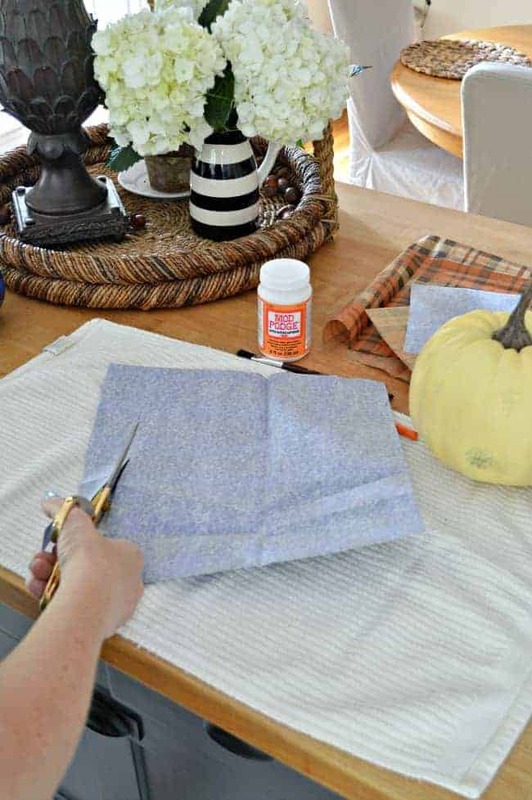 Are you working on any fall projects right now? 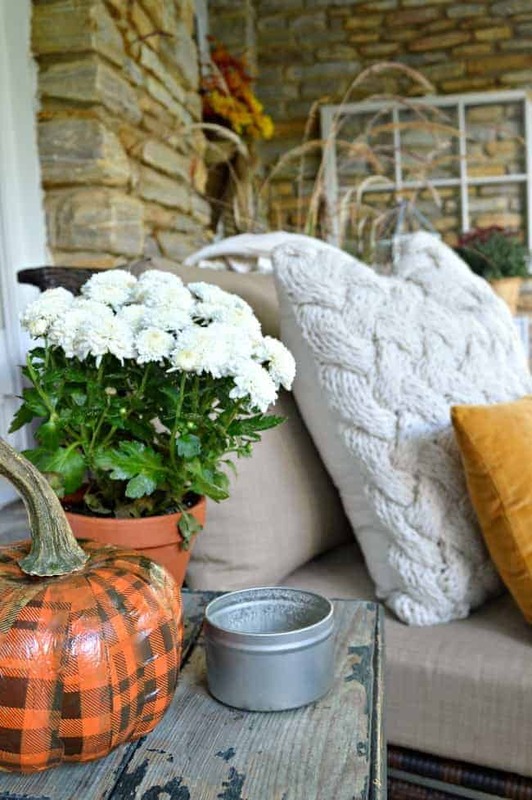 Don’t forget to check out my fall home tour and my fall front porch. 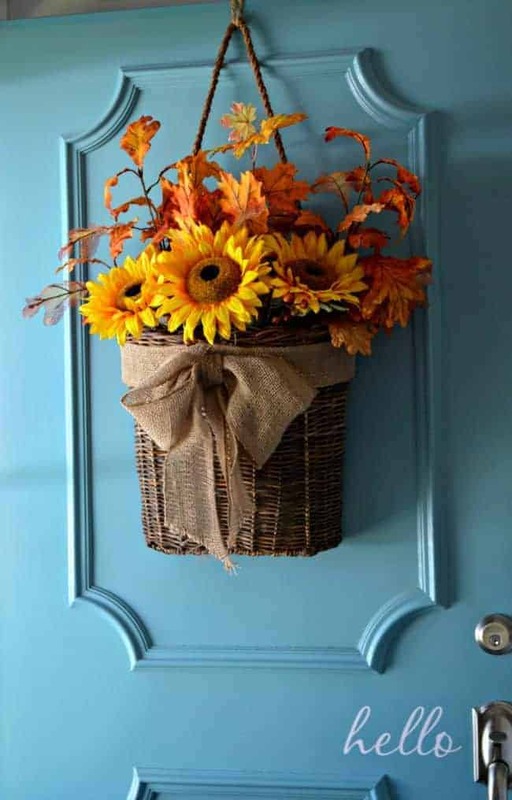 Here’s another easy fall DIY that I made for our front door when we lived in Illinois. 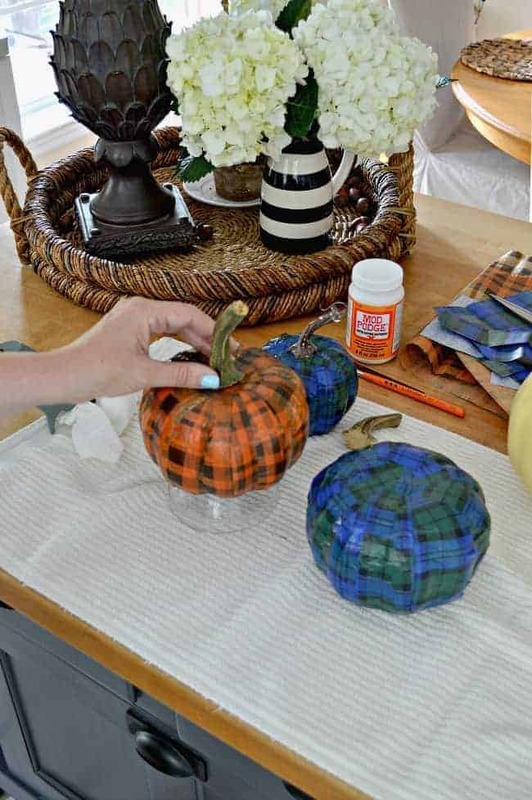 What a fun way to dress up those dollar store pumpkins. I have the same ones and I’m still trying to decide how I want to decorate them. Thanks for a great idea. Thanks for sharing at Snickerdoodle! Pinning. 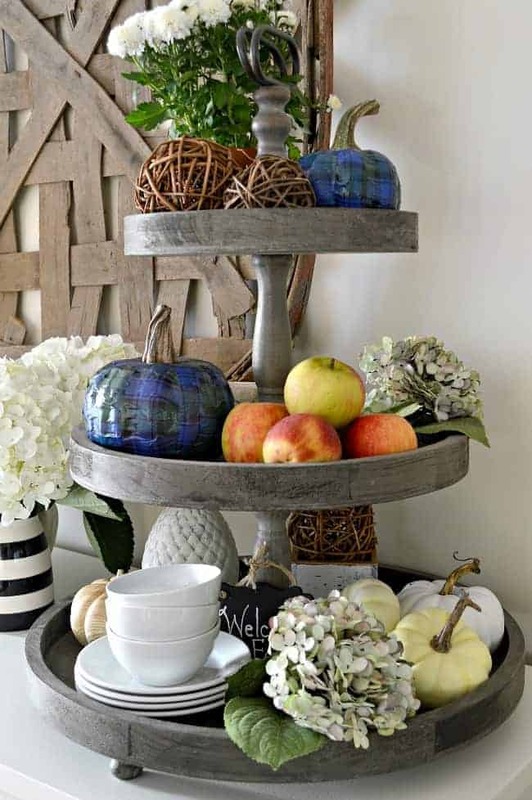 I was looking for ideas for decorating a tiered tray when I came across your blog. Your tray looks beautiful! I found mine from a site called The Painted Fox and now I’ve got pumpkins and things in it. It’s so versatile for holidays. 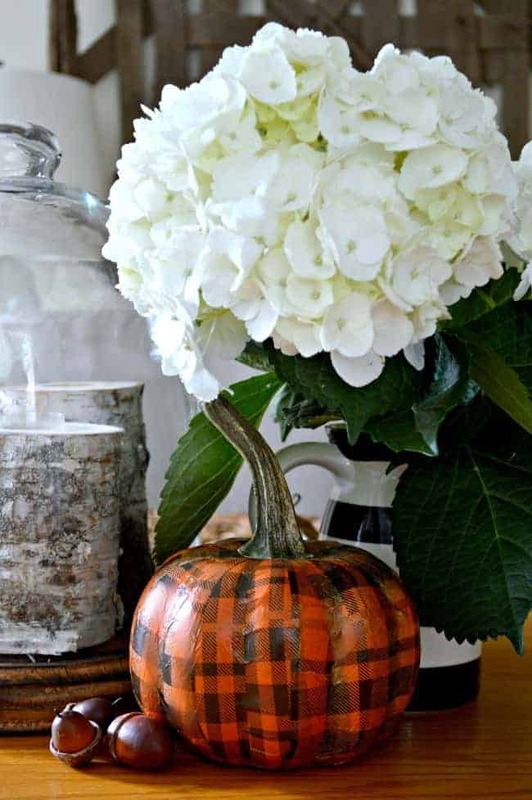 I love your plaid pumpkins also! Thanks so much, Kathy! Love my tray too. You are so right, it’s very versatile. Hope you have a great weekend. What a super cute idea! 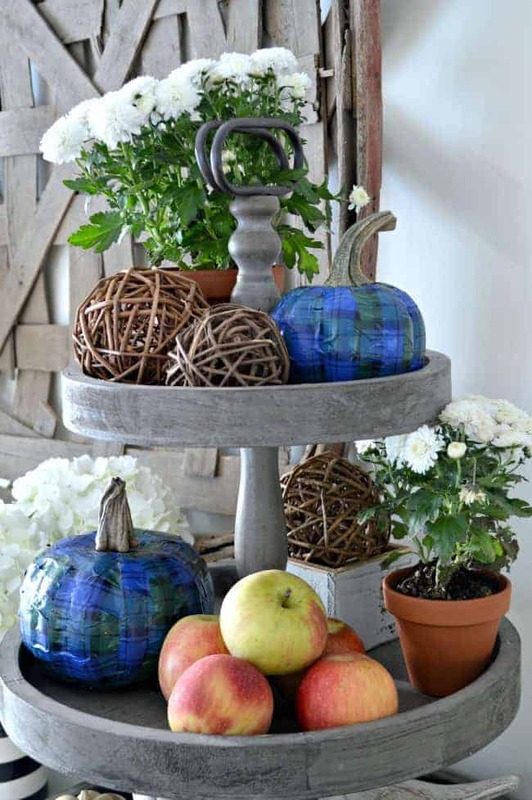 I love the plaid pumpkins! Your pumpkins are some of very best have seen done, even the fancy velvet ones. Love both plaids but orange one is my favorite too. Seems like can’t have enuf pumpkins and other Fall decorations, love colors of Fall and all the cozy decorations everybody comes up with. I see so many want to make but have just so much room to put them in our small house. Plus hubs gets fussy when I do too much, have to agree with him. Love making things, decorating with them but afterwards not crazy about packing it all up. 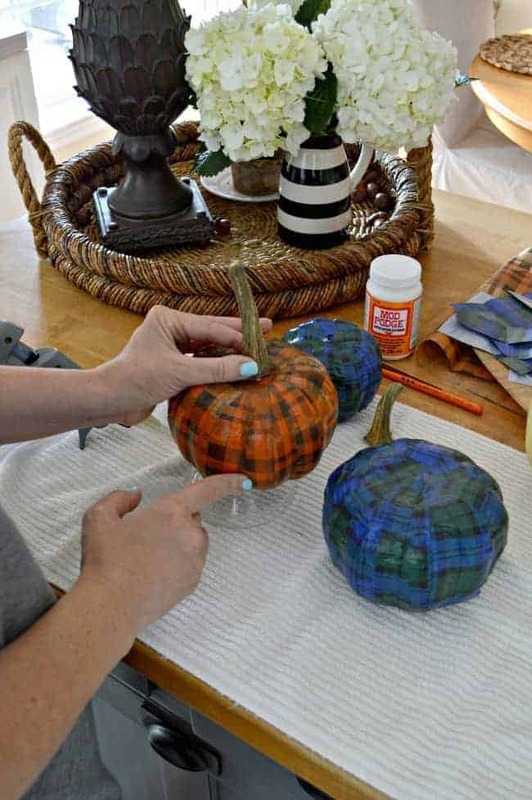 But – just have to make at least 2 or 3 plaid pumpkins, where did you get your tissue paper? When we went to $tree last week they were out of pumpkins, seems people shopped for them earlier this year and I can’t remember what I did with previous years $tree pumpkins, doggone it. Can hardly wait to get paid on Wed. so can go shopping for some pumpkins, hope grocery store has some little white ones. Awwww, thanks so much for your sweet comment, JaneEllen. I wasn’t sure how they would turn out but I’m loving them and they were so easy to do. Fall decorating can definitely get out of hand, I agree with you. We have a small house too, so I have to be careful with how much I make and what I bring home. I like to use a lot of natural elements for fall so it usually turns out ok. 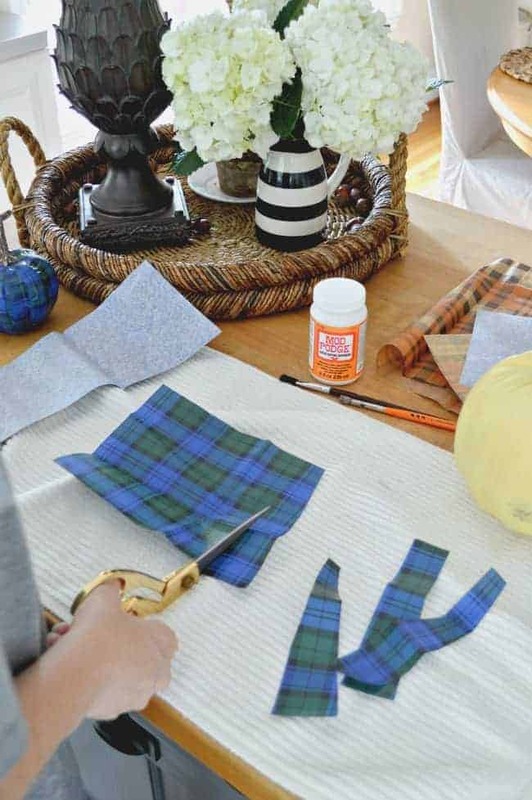 I bought my plaid tissue paper online from Acorn Spring Ranch http://acornspring.com/. Hope that helps and I hope that you’re able to make a couple for your home. love this! can’t decide which color I like best as they are both perfect! thanks for sharing on craft schooling Sunday! Thanks so much, Sara. I love how they turned out! You can never have too much plaid or Modge Podge! Love the dried stems also, the ones that come with the pumpkins aren’t the best. I agree Sandra, there’s no such thing as too much plaid or Mod Podge. 😉 Thanks for stopping in to check out my pumpkins. Gorgeous! 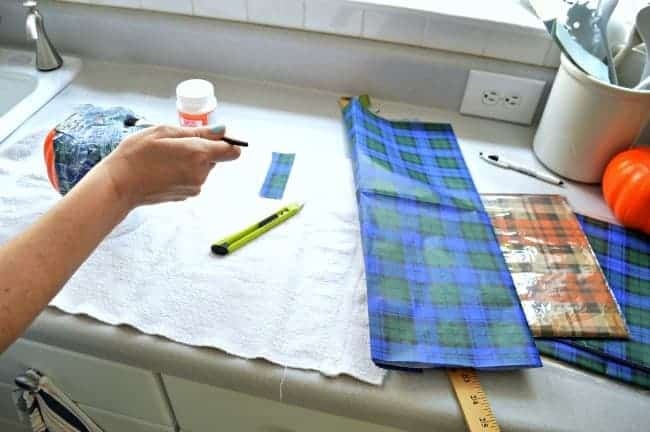 I love the plaid and the fact that it’s easy to do…a bonus! I’m new here and this is my first post. Wow, I had forgotten how much I love plaid! 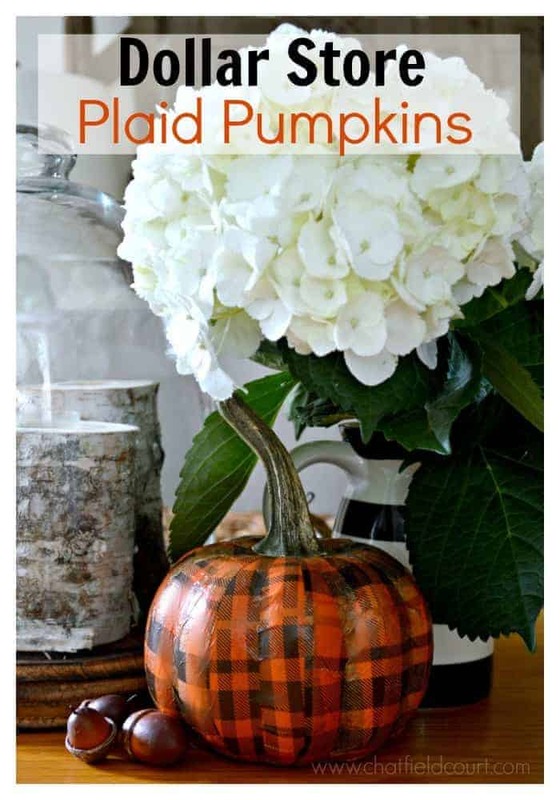 When you said plaid pumpkins, I had my doubts, but they are soooo cute! And I can’t believe somebody saved dried pumpkin stems, although I might have done something like that – LOL! Hubby and I retired and have moved into a really teensy house and I have zero room for crafting so I got rid of EVERYthing crafty, but I have already picked up a few thrift baskets and a glue gun, so I’m pretty sure I’ll be trying a thing or two, at least – regardless of the fact that I’m totally untalented! Your page is so full of beautiful ideas, I just love it. Thanks so much for sharing! Hello, so glad you found us! I wasn’t sure how my pumpkins would turn out but I really loved the result. I’m glad that you liked them too. I totally understand about no room in a small house. We just moved into our small cottage and I don’t have a lot of room for craft supplies or crafting, so I need to be choosy with what I hang onto. It’s great to hear that you want to start crafting again. Thanks for stopping in and saying hello. I hope you come back to visit. There’s just something about plaid, right? I totally agree with you on plaid shirts…they should be flannel and all kinds of soft and cozy. Really a great idea! Looks so beautiful and simple to do. thanks for the inspiration. Thanks!!! It was a really simple project and I’m thrilled with the way they turned out. How cute. I might be able to actually do this one. Where did you get the printed tissue paper? My favorite is the orange as well. Just reminds me of my uncles hunting jacket from when I was a child. You are very crafty Debbie, these would be no problem for you. I got the tissue paper online, by googling “plaid tissue paper”. Thanks for stopping by. Hope you have an awesome week. Cute idea! I love plaids and the mix of oranges and blues is perfection. Too Cute!!! I am thinking about John Deere plaid. I think that would be fun. Thanks Colette. John Deere plaid would be awesome!!! Let me know if you are able to do that, I’d love to see them. Now, this project is right up my alley! Love it and I’m with you . . . plaid = Fall!